Plenty of hypocrisy is always on the table for our leftist friends. It’s a hypocrisy buffet table right now and it’s hard to know where to start. How about right at the top? The pontiff likes to weigh in on many issues to include the environment, migrants, migrants, migrants, war, peace and migrants. What does the Pontiff not weigh in on? Bad governments in Mexico, Venezuela, the Palestinian Authority, Syria, Iran, and other places. These are the root causes for the migrant crisis. Who better to speak truth to power than the Pope? I guess it’s easier to scream at the American President and anyone else that would attempt to protect civilized society from the clear risks of open borders, with the Leftist Mob Media as supporting Greek Chorus. Francis, if you take on the these governments and speak clearly, you’ll be far more credible. Your predecessor John Paul II went to Poland and spoke of truth and hope. He facilitated the fall of communism with clarity. ‘Be not afraid…!’ Stop complaining around the periphery (migrants) of the real issue (tyranny). Take on the bad guys, and stop blaming the good guys for wanting security. The latest amusing hypocrisy is the accusation that Trump ‘legitimized’ Kim Jong Un, aka Rocket Man, by meeting with him. Like a flock of braying jackasses the likes of Morning Schmoe Scarborough, Chris Matthews and the other D grade regulars like Brian Stelter and Shepard Smith are all claiming that the meeting was a failure and we got nothing. It’s a fake news/hypocrisy soufflé! Obama met with the Castro brothers, socialized with them, and sent his dopey emissary John Kerry to do the hip bump with the despots in Iran. Not a peep out of the Leftist Mob Media; in fact they celebrated both of these disasters. This crowd of weaklings just had a group meeting to weigh in on everything except their declining flocks in their home dioceses. Among their fat headed ideas was using the ‘canonical’ processes of the church to punish those involved with implementing the United States’ immigration policies. Of course this means not doing so in accordance with their one sided view of the same. Soooooooooo – you would do what? Deny communion to Catholic politicos based on their actions? Or border agents? Excommunicate them? Once again, instead of focusing on the root problem – tyranny for example by the Mexican Drug Cartels, Mexican government, and the related poverty south of the border, we have bandwagon leftist prelates deciding to make dopey idol threats for the media to propagate. 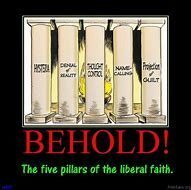 They are useful idiots for the Leftist Mob Media, which most of the time mocks the very faith they are pledged to evangelize. Those are the ones top of mind for me, if you have more, leave them in the comments section! Next Next post: Who Do Dems Support – Americans or Coyotes?